Imagine you are new in the city and many of your tasks need to be performed and you have no time for them or you are skilled professional waiting for the right opportunity to get hired. 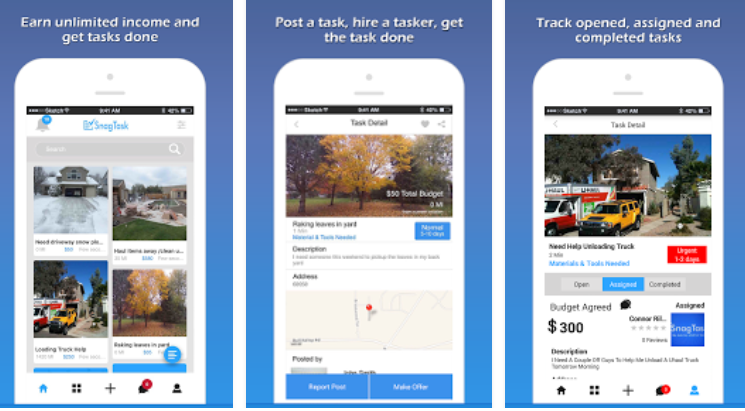 Do not look further now, as we have found an app, “SnagTask” for you providing the platform in giving you the opportunities and on the same time to help you in hiring the professional for your task to be completed. SnagTask is committed to facilitate you in running your life smoothly and to help you generate some revenue by using skills that you have. The app is very to use with simple login procedure. If you are skilled person, you can post unlimited gigs about the type of your services you provide. You can fill your details like availability hours, rates and distance. The person who is looking for the services will just have to write the keywords of services they are looking for in their local place. You can click the tasker profile to check his availability, distance from your place, rating and reviews about the previous services they provided. It is a great local service provider app! Service taskers can submit custom contracts, and negotiate about the rates. Allows posters to directly message the tasker or vice versa. You can also add your favorite service taskers in your list in order to hire them again. In addition, you can check out your past hiring history.